Cadet Midshipwoman Sydney Chambers caught herself fidgeting. Again. 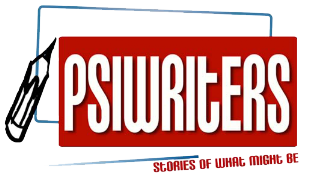 It was pages on the reader she held beginning to turn on their own that caught her attention, page turns caused by the mindless tapping of her fingers. With a flash of irritation, forced herself to be still. It wasn’t the first time during the routine, two-hour, shuttle cruise, that she had found herself edging into a mild state of physical agitation … which was the source of her growing annoyance. There was no obvious reason, no clear underlying cause, for her to feel in any way distressed. Her presence on the shuttle was, in fact, a form of reward for four long years of achievement. 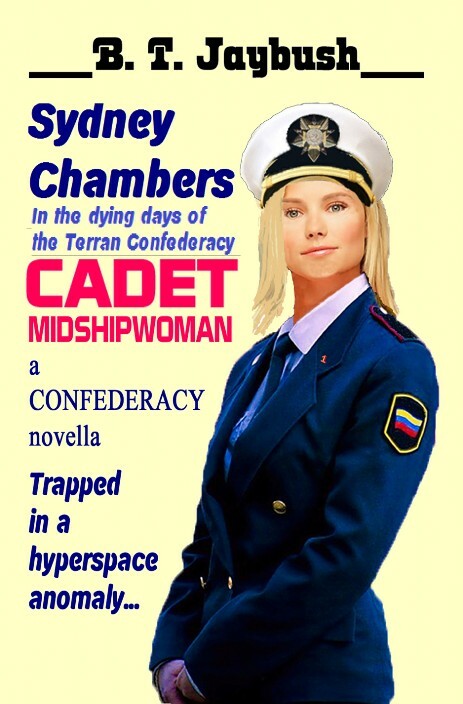 The Terran Space Military Academy was noted Confederacy-wide for its academic excellence, to say nothing of the prime physical condition of its graduates — or in Sydney’s case, soon-to-be graduates — and Sydney Chambers had repeatedly proven herself the best of the best among those Cadets and Cadet Midshipmen and Midshipwomen attending the Academy. Her imminent responsibilities as valedictorian at the approaching graduation ceremony was proof enough of that; the Graduation Valedictorian was, after all, a position determined by a combination of academic rank and conditioning, and for the entire term of her Academy attendance, Sydney had ranked first in both areas … a rare, if not unprecedented, feat. Of course, Sydney considered none of this as she once more checked the time remaining before her shuttle’s ETA at Terra Station Three. Her term at TSM Academy was, for all intents and purposes, complete, all courses finished, all exams aced. All that remained was graduation, in just over a month’s time … plus, the reason for her presence on this particular shuttle trip: her fourth, and final, Middy Cruise. Very few Cadet Midshipmen qualified for a fourth Middy Cruise. The cruises were designed, for the most part, for underclassmen: first-, second-, and third-year, students, with an eye to familiarizing them with the realities of service on space vessels of the Terran Space Military. The vast majority of Cadet Midshipmen were assigned billets on actual ships-of-the-line, serving out their three-week cruises by performing the drudge work that naval vessels of all types — and of all eras — offered aplenty. Indeed, all first-year Cadets spent their cruises in this fashion, for multiple reasons. Sydney had done so and, with the clarity of hindsight, considered herself the better for having had the experience. Only the top six academic achievers ready to graduate were rewarded with a fourth Middie cruise — rewarded for their achievements with a chance at actual command experience by being billeted as First Officer on their chosen mission. Sydney, as Naval Valedictorian, as well as the Academy’s Naval salutatorian, were given their choice of the six missions; the four other top fourth-year students were randomly assigned to the remaining Academy vessels. Each of the six ships was commanded by a seasoned officer. In the case of Sydney’s chosen mission, the captain was an actual Captain, Francis O’Flannery, whose current assignment was professor of tactics at TSM Academy. Though pleased to find O’Flannery as her captain, his posting hadn’t affected Sydney’s choice; the missions were listed with no reference to participating personnel and only the most general reference to functional orders. It happened, though, that O’Flannery’s classes were some she had particularly enjoyed. Additionally, the Captain had impressed her with an agile mind and a keen grasp of tactics. In short, Sydney was headed for what was essentially an academic victory lap … yet she couldn’t manage to shake the feeling that something was off. She had reviewed her qualms over and over and there was nothing she could put a finger on, but the continuing itch of misgiving was driving her to distraction. The mission itself — a precis of which was on the reader she had been studying when her nerves had offered their internal tap-dance — was theoretically straight forward: investigate a star system that, despite its close proximity to Sol, hadn’t yet been surveyed. In fact, the system had barely been approached due to the presence of a hyperspace anomaly dangerous enough to be assigned a “DO NOT ENTER” Delta-Epsilon status on military as well as civilian charts. Trouble was, the anomaly displayed recent signs of growth. When originally noted it had merely emanated from and surrounded the Epsilon Eridani system’s sole planet. Recent distance scans, however, showed that the anomaly had completely swallowed the star system, to a distance of eight astronomical units — in other words, significantly farther than the distance of Jupiter from Sol. While Epsilon Eridani lurked more than ten light years from the Solar System, any growth in something as dangerous as a hyperspace anomaly raised red flags with the Confederacy’s scientific community. The Terran Space Military had therefore been tasked with investigating … to get, at the very least, a handle on the rate at which the anomaly was growing. TSM’s response was as muted as it was unspoken: we’ll do it, of course, but we’re not about to spend any more time or money on the project than we must. Hence, the survey was folded into the next available round of Academy cruises, cruises which traditionally carried formal mission status. The corvette TSM Hurricane drew the assignment; Sydney Chamber had opted for the Hurricane as her fourth middy cruise based on as many factors as can be imagined … not the least of which was her own gut, a thing she had learned to trust over the course of her twenty-two years of life and, in particular, her four years of Academy training. Now, after learning the parameters of the mission to which she was headed, that same gut was screaming at her: Beware! Beware! Ten of those faces bobbed at him as if in synch, acknowledging the truth of their captain’s statement. Only Sydney, standing behind O’Flannery in the traditional First Officer spot, held her peace. The fact that the planet hadn’t been surveyed bordered on irrelevant; the more relevant question was, can the planet be surveyed? Even more important, can it be surveyed safely? It was that point O’Flannery then began to address. “Just because the planet itself has yet to be surveyed doesn’t mean we haven’t learned anything,” the captain continued, casting his gaze around the briefing room table where all but Sydney sat. “The anomaly emanating from Epsilon Eridani has been probed … cautiously … over the years. Several important items have been documented. “No hyper, Captain?” The questioner was George Gordon, ranked acting ensign as were all third-year midshipman, and designated chief engineer for the cruise. “No hyper,” O’Flannery concurred. “We will drop out of hyperspace well beyond the reach of the anomaly. Helm officers, make special note and double-check that all automatics drop us to space normal at nine AU. All hyper equipment is to be shut down at that point.” The order drew acknowledging nods from Ernesto Conseco, Geraldine Paige, and Zoey Cummings, the three midshipmen who would pull eight-hour shifts as pilots of the Hurricane. “How straight, sir,” Georges asked. “Straight as an arrow,” O’Flannery returned, “unless you need to bend around something big. Epsilon Eridani may have only one planet, but there is a lot of junk in orbit — a straight approach will compensate a bit for what we give up in speed but we still need to be alert. Helm, watch out for that junk. Most of it is too small for a course to navigate around.” Conseco, Paige, and Cummings, acknowledged silently. “Yes, sir,” Sydney acknowledged. Comm officer Anita Benning added a terse nod; the other comm-designated student, Eric Friedman, merely blinked. “Thirty-seven hours, Captain,” Sydney responded. There were the usual shuffling noises, but little talking, as the acting officers wended their way from the ship’s conference room. Sydney waited, silent, for her captain to have his say. O’Flannery turned to his executive officer once the last junior was gone. “Thank you, sir,” Sydney little more than murmured, and hoped that she wasn’t blushing too badly at the reminder of her flexible thinking. The exercise in question had netted her a commendation from Academy brass in addition to a grade of one-hundred-and-twenty percent. Sydney felt her cheeks flush and worked desperately to maintain eye contact with the captain. “Sir.” Recognizing a dismissal when she heard one, Sydney nodded, then headed herself toward the conference room exit. “Check your mail for a package from me, XO,” O’Flannery added just before Sydney reached the hatchway, causing her to pause and turn back toward her superior. Sydney blinked once, then nodded. “Thank you, sir,” she allowed, then quickly headed for her quarters. Her own gut reaction hadn’t been eased in the slightest by O’Flannery’s words. The voyage passed with confounding smoothness: Hurricane dropped out of hyperspace exactly on schedule and continued as planned, crossing the anomaly’s edge without so much as a ripple or a quiver. The hours of passage that followed passed in equal smoothness; even the three helm officer found little need to swerve away from space junk. The one notable exception was, of course, that all subspace communication signals vanished, a situation about which Captain O’Flannery expressed a strong lack of concern. “Aye, sir,” Hawkins responded. Sydney felt a twitch in her gut at the exchange; the topic intersected with the one potential problem that her tactical analysis had detected. Out of touch is one thing, the thought again occurred to her, but forcibly out of touch is a bit more worrisome. Still, she had reported the concern to O’Flannery, but made no recommendations … a lack in her command brief that she would later question. Standard orbit was achieved with nary a whimper. Now, watching the Epsilon Eridani planet rotate placidly on the Hurricane’s command screen, Sydney felt her unease grow despite the apparent calm of the situation. There was still nothing she could point to as the source of her disquiet; indeed, the planet — catalogued unsurprisingly, if unimaginatively, as EE1 — seemed tranquil, almost Eden-like in its features. The oceans boasted a slightly more orange cast than Earth’s deep blue depths … and added emphasis to their odd coloring by covering nearly the entire surface of EE1. No land masses larger than a few hundred square miles spoiled the aquatic expanse, and those were few and far between. The vast majority of dry land appeared as small to tiny islands, specks ranging in size from less than a square mile to large enough to host a medium-sized estate. It was on one of the islands, a decidedly average sized land mass, to which Hurricane’s instruments pinpointed the anomaly’s epicenter. Sydney had felt a wash of misgiving flood her when navigator Theo Georges, doubling as science officer given the small crew size, had announced that little tidbit. Reason — not to mention a basic understanding of hyperspace — screamed that an anomaly such as the one they were in should be centered far from any mass, let alone a mass the size of a planet … let alone on an island on that planet. Yet, Georges insisted the reading was accurate. “Yes, Ma’am,” came from both officers before she had covered halt the distance, short as it was in the corvette’s smallish command cabin. She had barely arrived and the holo was still resolving itself when a voice announced, “Captain on the bridge!” and Sydney sensed O’Flannery arrive at her side. “What’s the story, XO,” the captain asked without preamble.